Good first dates should be like sneak peeks: exhilarating, butterflies in the stomach and leaving both of you (hopefully) wanting more. Impress your date with a rooftop view, stunning interior or conversation-starting cocktails at these romantic bars. Located in one of the world’s leading luxury hotel brand that delivers nothing short of excellence, Bar Trigona is just as impeccable for a most lavish possible night out. Head bartender Ashish Sharma pays homage to local ingredients, such as local honey (its namesake pays tribute to a local stingless bee) which makes for an outstanding cocktail menu. Beautifully curated cocktails, dazzling interior and plenty of luxuriously plush seats definitely set the tone for great getting-to-know-you dates through in-depth conversations. Address: Level 6, Four Seasons Place, 145 Jalan Ampang, 50450 Kuala Lumpur, Malaysia. Next on our list is Cielo, which boasts a handsome view of KL’s city skyline from its 23rd floor rooftop location in Vida Bukit Ceylon. With the city’s unpredictable weather, Cielo’s retractable roof definitely comes in handy. Cozy and intimate, yet classy chic makes Cielo the ideal setting for a dreamy romantic night out. Loved for its seafood, the restaurant is equally famous for its dessert. Make sure you have room for that. High above on the 33rd floor with a breathtakingly stunning panoramic view of the city, paired with fabulous signature cocktails, SkyBar definitely sets the benchmark for rooftop bars in KL. Be sure to sit by the pillow filled cabana window seats overlooking Kuala Lumpur’s iconic Twin Towers (fully visible) which makes the perfect setting for small talk. Located on the top floor of WOLO Hotel with its handsome architecture and excellent location, stepping into Mr. Chew’s feels like you are being transported to a sophisticated penthouse of an elusive billionaire in New York. Probably one of the most sophisticated places to dine in, this place has all the makings of a date spot, whether it is a first or a special occasion. There are several options to progress the date throughout the night: dining area, main bar, an equally charming hidden bar upstairs, and a dedicated dessert bar that offers a 6-course degustation menu with alcohol pairing for a sweet ending. Planning an adventurous date filled with spontaneity and surprises? From drinks from the afterlife to being blind for a night, here are some of the most unpredictable and quirky restaurant/bars in town. All of them have one thing in common - unique experiences that you won't find anywhere else. How does it feel to be truly blind and let only your other senses guide you? Definitely a unique experience, Dining in the Dark offers a date night where you not only discover more of each other but also yourself. Literally, in the dark of what you are about to eat, you will be guided by visually impaired servers. More than just a dinner date, embark on an intimate sensory journey that you and your date will never forget. One more thing, no phones are allowed throughout the experience. This calls for no distraction and uninterrupted conversations! 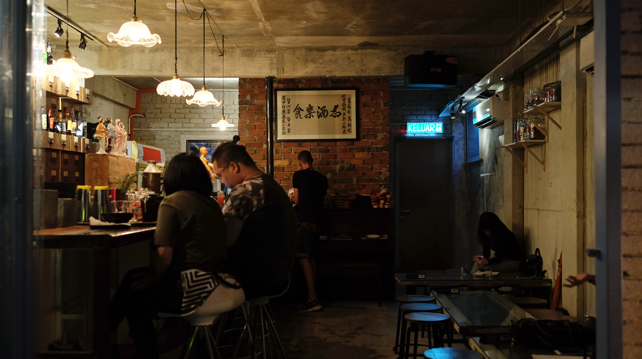 One of the first speakeasy bars that paved the way for KL’s burgeoning cocktail scene, every visit to Omakase + Appreciate is always an adventure. Cocktails are specially crafted to your desire, à la Japanese omakase style. In a Japanese restaurant, omakase means “I’ll entrust my meal to the chef” Definitely a conversation starter as both will get to know each other’s favourite (and least favourite) drink profiles. Led by 2 industry veterans, Shawn Chong and Karl Too, much thought and attention to detail have been devoted to its menu. You will definitely be in good hands. Decidedly not for the faint-hearted, a trip to The Deceased guarantees a thrilling adventure. The dingy blood stained stairwell followed by eerie wailing sounds leading to the bar, dusty traditional Chinese drugstore set up, you might notice severed body parts too. Drawing references from Chinese folklore to Western pop culture, every cocktail has a story to tell. Sip your night through The Ouija or The Medium and finish with Tea of Oblivion to forget the unpleasant moments of the date. Be warned, there might be an invisible third wheeler throughout your spooky date night. Sometimes, all we want is to kick back and relax with a well-executed Negroni served over a perfectly cut clear cube of ice. These cosy watering holes are perfect for casual dates to your 150th date. Not to mention, at reasonable prices too! Inspired by having a laid back place where you can feel the tropical breeze and have tantalizing Afro-Caribbean food paired with tequila, the stellar team behind Joloko has created a chilled hangout where you can really let your hair down. Together with its vibrant colourful interior, well-crafted cocktail menu, extensive choice of Mezcal (with well over 40 varieties behind the bar) and cozy corners for lovers’ tryst, this place attracts many young couples. Three traits that land Coley on this list are the cleverly executed cocktails ranging from Old Fashioned to ones inspired with local ingredients, relaxed interior with lush greens, and friendly service. It’s hard to think of a better setting for a laid back date night than this: pull up a wooden chair, order a Gin and Coconut koktel while snacking on crispy stuff (lightly fried varieties from nori, red cabbage to fish maw). Be transported back to the 1960s, feel at home and instantly fall head over heels with each other, with the help of Mrs. Jones’s mysterious love potion, Heart of Mary. Retro, charming with a sense of nostalgia, the city’s newest specialist gin bar certainly makes you want more (of each other). Just make sure not to order Babbling Beverage as it may cause you to babble uncontrollably. Stepping into JungleBird or fondly named as “Rumah Rum”, you will immediately feel at ease. Cozy up with your date on the sofa with leafy-printed pillows with the bar’s signature namesake Jungle Bird, the classic Malaysian cocktail originally created at the old KL Hilton. As JungleBird is a rum bar, be sure to learn a thing or two about their extensive rum collection from the passionate team, which makes it altogether a fun night.